While Barack Obama speaks without blushing about the virtues of the Northamerican “democracy,” and lectures us on human rights, an innocent man languishes in his cell, totally isolated, awaiting only death, or for what the U.S. President alone can, but does not, do. Leonard Peltier, Anishinabe-Lakota, a leader of the American Indian Movement, AIM, writer and poet, has just completed forty years in prison, and is one of the political prisoners jailed for the longest time in the whole planet. When he was captured, in February 1979, he was a young man, struggling for the rights of the Native peoples, who had already known repression and jail from an early age. Now, almost blind and very ill, he endures a cruel and totally unjust captivity. Condemned without a single piece of evidence, in a process characterized by manipulation and illegality, he was sentenced to two consecutive life sentences (SIC), that he has been serving in maximum security prisons, subjected to particularly harsh conditions, with an inhumanity that considers neither his fragile health nor his advanced age. In the decade of the Seventies, last century, the repressive and racist nature of the Northamerican system unleashed its violence against those who opposed the Viet Nam war, and also against Blacks, Puerto Ricans and the Native nations that have been dispossessed of their lands and are confined in so-called “reservations”. In 1973, the massacre of Wounded Knee took place, in the same location where in 1890 the great confrontation between Native nations and White invaders occurred. In both confrontations, numerous “Indians” lost their lives, including children, women, and the elderly; and no one has faced justice for these crimes. The atrocity of Wounded Knee II and the growing presence of agents of the Federal Bureau of Investigations, the FBI, and paramilitary groups created an atmoshphere of terror in the area where recent discovery of uranium and other minerals had fed Anglo-Saxon greed. Solidarity spread to other sectors. Marlon Brando, 1973 Oscar winner for his memorable performance in The Godfather, turned the ceremony into a unique denunciation: in his place, he sent Apache actress Sacheen Littlefeather, as he protested the treatment of the Native people and the massacre at Wounded Knee. “It seemed absurd to me to attend the awards ceremony. It was grotesque to celebrate an industry that systematically has slandered and disfigured the Northamerican “Indians” for six decades”, Brando proclaimed. In any event, several facts were evident. The Native people were harassed in their own refuge, which they did not leave to attack anyone. Who penetrated the reservation, before the incident, were scores of heavily armed FBI agents, as were the armed paramilitaries at their service. If any Native had fired a weapon, something that has not been proven, it would have been a desperate act of self defense. The authorities only filed charges against Native people. Peltier sought refuge in Canada, where he was captured on February 6, 1976. Meanwhile, his comrades were freed for lack of evidence. The charges against Peltier were fabricated from beginning to end by the FBI. Revelations that followed the trial, obtained after long efforts by his defense attorneys through the Freedom of Information Act, prove the fraudulent character of the whole process: false testimonies obtained through blackmail and threats, presentation as “proof” of a weapon that was not there, which was never used by Peltier, and had absolutely no relationship to the incident. In a hearing before the Court of Appeals in 1978, one of the Prosecutors who acted against Peltier, had to admit it: “We do not really know who fired on the agents”. That tribunal, however, upheld the conviction. The trial of Peltier was a farse of monumental proportions. It was convincingly proven by Robert Redford, another great Northamerican artist, in his documentary “Incident at Oglala: the Leonard Peltier Story” , produced in 1992, but so severely censured that few have ever seen it. The reasons are obvious. According to the May 22, 1992, Washington Post: “It is very difficult to see ‹‹Incident at Oglala›› without concluding that Leonard Peltier is innocent… his trial was nothing but a farce cooked up by the Government. This direct and illuminating documentary shows the lengths to which the unscrupulous prosecutors and FBI were willing to go to punish this man”. Nelson Mandela, the European Parliament, and numerous personalities throughout the whole world have spoken out for the liberation of Leonard Peltier. The demand for his freedom has lasted more than four decades, so far, without results. Ramsey Clark, former Attorney General of the United States, said some time ago: “Until he is free, each new day is a new crime, each dawn is a new crime, each evening, a new crime against the dignity of the Native people and against the honor of the United States of Northamerica. Because as long as Leonard Peltier is in prison, we all are in prison”. 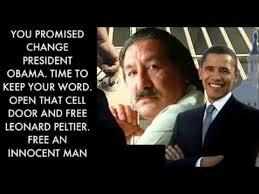 When Peltier was arbitrarily incarcerated, Barack Obama was a teenager, and was not responsible for that injustice. But for the last eight years he has borne the responsibility, because as President of the United States he has done nothing to free him. President Obama knows that “Sí se puede” , but he prefers to be an accomplice of the crime. A translator’s note: It would be greatly appreciated if as many people as possible were to forward this message to President Obama. It is now or never.Free translation from the Spanish published by Cubadebate, on March 30 2016, sent by Nils Castro, [email protected] Done at REFUGIO DEL RIO GRANDE, Texas, EE.UU.